Peaceful and beautiful. 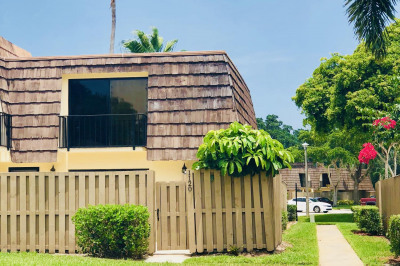 Fully renovated 2 Bedroom 2.5 Bath Townhouse in coveted Sandalwood Estates-Palm Beach Gardens. Desire and Private area with Beautiful Landscaping. SOLID CBS CONSTRUCTION Spacious Open Patio great for Entertaining. Stunning Kitchen featuring new Stainless Steel Appliances, new water heater,Ceiling Fan with Lighting.Renovated Master Bedroom and Bath featuring New Tile Shower, New Vanity,Large Walk-In Closet. New Tile Flooring Upstairs.Tile flooring throughout. Minutes to I-95 and the Turnpike, close to PGA Blvd, Gardens Mall, and good Restaurants. Minutes to Juno Beach, Jupiter Beach and Singer Island, Downtown Gardens,25 minutes to West Palm Beach Airport.And even more!! !a storage shed with an extra refrigerator for your entertainment events.